Hi foodies. Welcome to AYESHA'S KITCHEN. Paneer bhurji or scrambled paneer is a popular mildly spiced North Indian breakfast which is served as a side dish with paratha, dosa, chapati and even with bread. 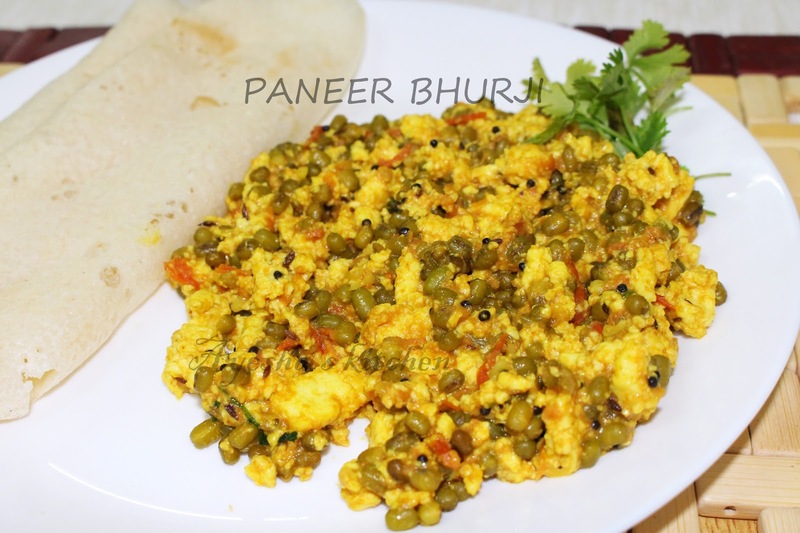 Recipe of paneer bhurji is very simple but very delightful dish for all vegetarians. Preparation of this dish is same like egg bhurji. It tastes delicious and is a good source of protein too. Here the crumbled paneer is added to the sauteed tomato and spice gravy, simmered for few minutes and then ready to serve. So simple .. 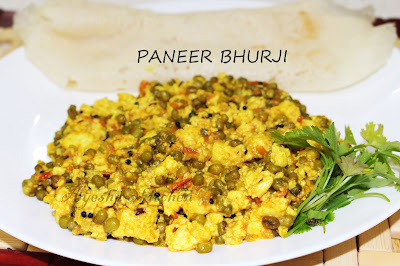 I just skipped the use of onion in this dish (veg recipes without onion and garlic).. .Let's see how to make tasty paneer bhurji or spicy crumbled panner recipe / healthy breakfast ideas /breakfast recipes vegetarian /veggies recipes side dishes. Soak the paneer in hot water along with few tsp of salt for 5 minutes. When done, drain the water and crumble the paneer. This makes the paneer soft and if you are using fresh paneer, skip this process. Set aside. Heat oil in a wok. Splutter mustard seeds and when done add green chili along with the cooked green gram. Cook for 5 minutes or until done and then add chopped tomato along with chili powder, coriander powder, turmeric powder, and salt. Mix well and cook until the tomato and green gram becomes soft. Now add the crumbled paneer and cook for 2 minutes. Saute well. Do not cook the paneer more as it will lose its softness. If it is dry, add few tbsp of hot water and mix well. Finally, add chopped coriander leaves and is ready to serve.